6.67 points at 15 votes (rank 451). The mighty tyrant Death Adder has raided the land Yuria with his troups and reduced it to ashes. The population was almost completely killed or enslaved. The king and his daughter were abducted and emprisoned by Death Adder, the holy relic, the "Golden Axe", was robbed from him. 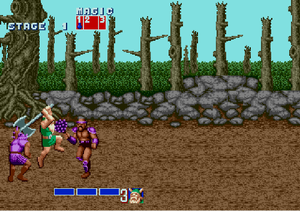 Golden Axe is a classic side-scrolling beat'em up in a gloomy fantasy atmosphere. The coin-op board was converted for a number of different systems. 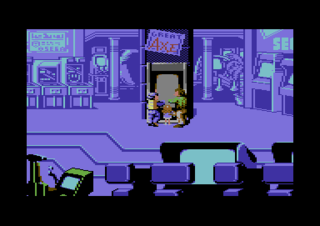 Unfortunately, there is no 2-player snychrone mode on the C64 and they also had to cut back on the graphics. Next to the enemies, there are also every now and then small goblins from which you can take magical pots and healing potions. The annoying tots preferrable appear at night and try to steal the players' supply. The magic from the magical pots can be collected and then activated. 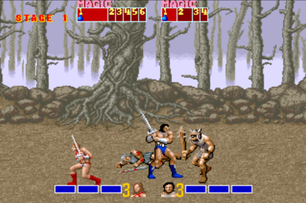 The player has three continues after he has drawn his last virtual breath, Golden Axe is after all a conversion of an arcade machine. 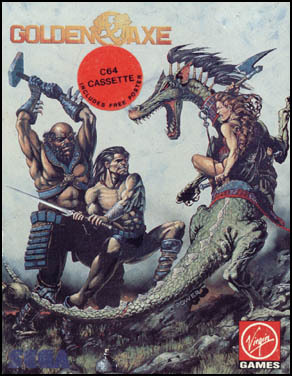 The barbarian's name is Ax Battler in other conversions, on the C64 he is named Axe Battler. This seems a bit paradox, because he fights with a two-hand sword. 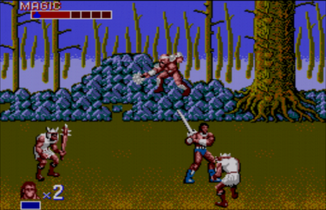 Also the golden axe, that the dwarf warrior uses as a weapon, can be a bit irritating, as it has - according to the story line - only in the arcade version and a few other conversions something to do with the name-giving Golden Axe. 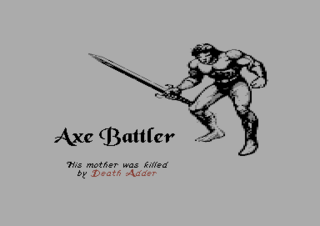 Axe Battler is a dark-haired hero of the barbarians. He is able to use the volcanic energy of lavl for his spells. His mother was killed by Death Adder's troops. He is the most balanced character, has a little better reach, but less magic power than Tyris and is not so strong as Gilius - but has in comparison to him more magic power. 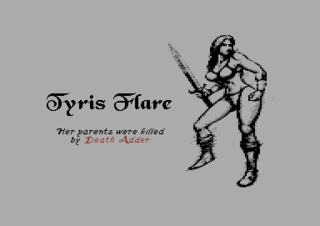 Tyris Flare is an amazon with red-brown hair who swings her sword while being lightly dressed. Her parents were murdered by tyrant Death Adder's armed forces. Her mighty spells use the energy of fire, with enough magic power she can even conjure up a gigantic, fire-breathing dragon. She is as strong as Axe Battler, but has the shortest reach with her sword. 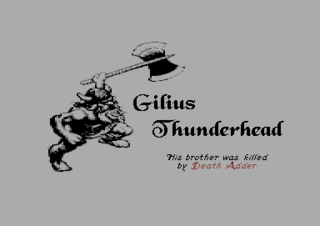 Gilius Thunderhead is a white-haired, bearded dwarf warrior. 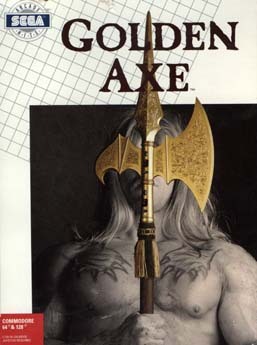 He swings a golden axe and is extremely strong. He wants the revenge his brother's death, who fell victim to Darth Adder's army. Although he does not understand a lot about magic, he has an enormous reach with his battle axe despite his shortness. For his spells he uses the power of lightning. Death Adder is a huge tyrant who terrifies the land with his army of mercenaries and undead. Next to his enormous strength and speed, he also uses different types of strong spells. He abducted the king and his daughter and is responsible for the death of many innocents. The Woods Here the cruel troops of Darth Adder spread terror and horror in the population. Turtle Village Here are the soldiers a bit more intelligent and you also find Bizarrians. Approaching the Castle The castle of Darth Adder is within reach. 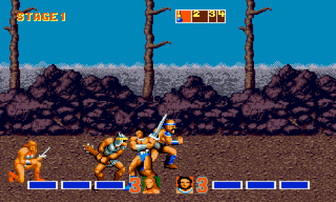 Partially it is not possible to proceed further before all enemies on the screen are destroyed. A sword with the word "Go!" flashes, as soon as scrolling is possible again. Knights can be pushed off their mounts (Bizarrians). Then there is short time span to get on yourself. While you are riding on a Bizarrian it will take the enemies' blows. Bizarrians have different abilites depending on the race. 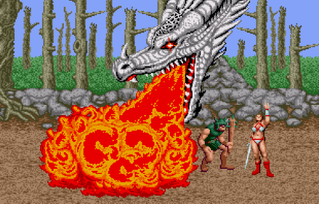 Some can breathe fire or fire balls (press fire button), others cause harm to the enemies by beating with the tail (pull joystick left or right). The activation of the magic in the pots works only on enemies in the current screen. The version by "Nostalgia" contains all 5 levels, the manual and different cheats (played through and OK - H.T.W ). Shmendric: "Unfortunately a mucked up conversion. 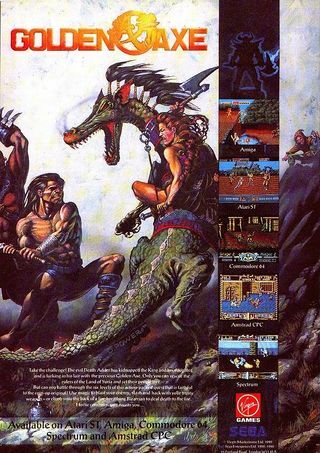 I have played through Golden Axe on the PC several times in the old days, it had the best graphics and acceptable controls despite using the keyboard. The sound, however, was awful. But I had no fun at all on the C64.."
H.T.W: "Normally, such bashing games cannot enthuse me (and this one cannot either), but the controls are exact and by the possibility to mount a "pseudo horse" (why does this remind me of the dinosaur race of the Caveman Ugh-Lympics) and use its abilities and by the fact that the given number of hits until death and the type of attack pattern of each enemy stay the same, facilitates the game. Summary: It cannot match with the arcade machine concerning graphics and fun in the 2-player mode, but it is one of the better conversions. 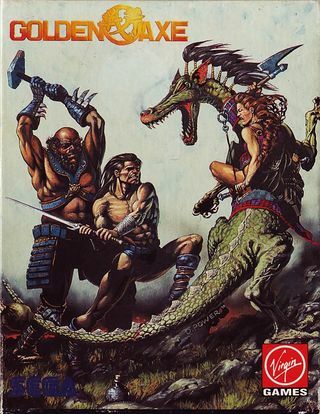 The first tapes that were delivered by Virgin Games contained an unfinished version of the game. The last level was missing (level 5). This bug was fixed a short time later, but there are many crack versions out there that contain this mistake. The version by "Nostalgia" is error free. 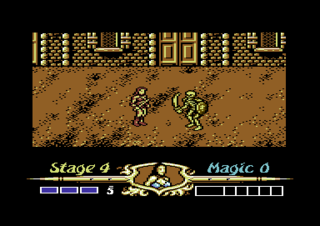 The numerous sequels of this series were not converted for the C64. None of the arcade conversions were really to the liking. 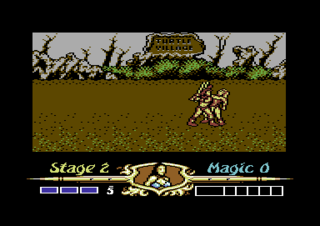 The controls on the Amiga were seen as an unprecise gamble, on the Master System the resources did not allow a 2-player mode and the background graphics caused a quiz game. On the PC were graphics and technical converson blameless, but no sound card or joysticks were supported. The 8-bit systems displayed in general significantly less sprites at the same time on the screen. 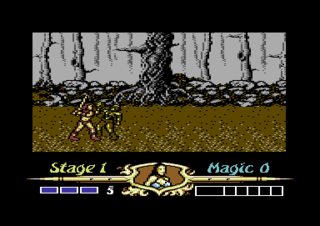 The Mega Drive version was indexed until 2006, then it received an age rating of 6 years. In some versions splattering blood and village inhabitants that are harassed by soldiers were removed. Partially the background story of the game varies. 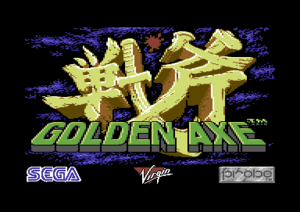 So partially, Gilius is the "carrier of the Golden Axe", partially was the name-giving axe also robbed by Darth Adder. In some versions, Gilius has an axe of steel in his hands. 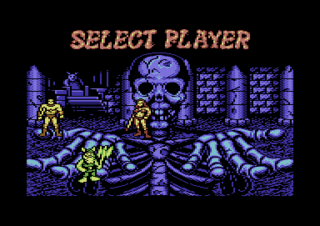 ...and on the SEGA Master System. 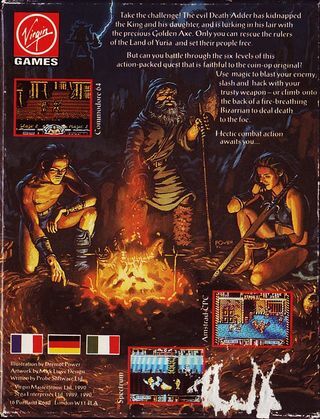 In this game no points are given in the C64 version, therefore no highscore is possible.